The scene was perfect for this sell-out crowd and for Tritonal’s vision. Soundcheck is known for its remarkable ability to bounce frequencies through earlobes and bring mind-bending bass to your face! Tritonal started their set in great fashion as they began with the duo playing some tracks off of their latest album, Painting With Dreams, setting the tone for the evening. The guys would start with a slow pace and then gradually increase the BPM — and the intensity among the crowd! 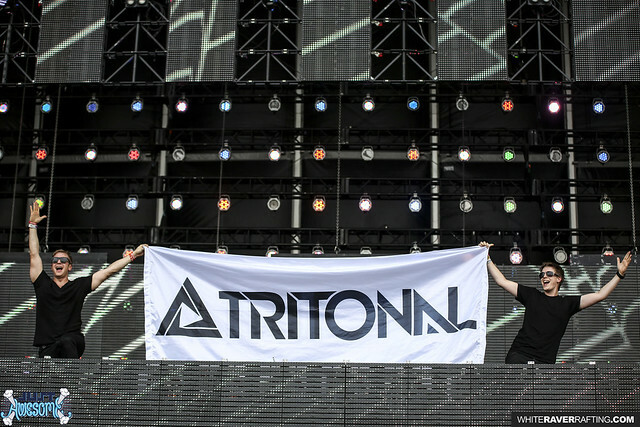 Tritonal featured one of their newest tracks in the build up with help from the Canadian duo Sultan & Shephard! The former Trance DJs continued to shuffle through their arsenal of tracks from throughout the years and pick out some bangers. They also created some amazing new sounds on the fly throughout their set! Chad and Dave mixed some of their original sounds with some classic EDM tracks that really brought the flashbacks to the crowd, blending and dropping nostalgic live mash-ups throughout the night. Tritonal made smooth transitions and blended track after track, easing in new melodies and crafting the night’s soundtrack! The melodies hit the audience with a heartfelt series of hi-hats and kicks that sent everyone into a frenzy. We got “feels” right before we were catapulted into the sky after the breaks ended and the drops HIT! The energy hit its peak and voices were lost as the crowd was no longer able to speak due to singing and screaming along to their favorite tunes being bootlegged and mashed up with one another! My rating for this show is 10/10! Tritonal exhibited a stellar performance in front of the sold-out Washington DC crowd for the third time in three months after performing at Echostage back-to-back nights! These two can be heard throughout the months through Spotify Apple music SoundCloud to catch their podcast series called “Tritonia.” With a 10/10 performance on their 10-year anniversary tour… Tritonal showed why they have been around for 10 years and why they will remain relevant for the decade ahead!